The monument commemorates King George V who was the second eldest son of King Edward VII. He first visited Australia with his elder brother Prince Albert aboard the HMS Bacchante in 1880. They were both midshipmen and George seemed destined for a professional career in the Navy. All of this changed when his brother, Prince Albert, heir to the throne, died in 1892 after contracting pneumonia. Prince George therefore became heir apparent and went on to marry his brother’s former fiancee who later became Queen Mary. George V visited Australia again with his wife as the Duke and Duchess of Cornwall and York in 1901. The purpose of the visit was to officially open the first Federal Parliament in the Exhibition Buildings of Melbourne in 1901. King George V died in 1936. The outbreak of World War Two delayed the construction of Bowles’ memorial to him, which was funded by public subscription and by council. Melbourne, Tuesday. 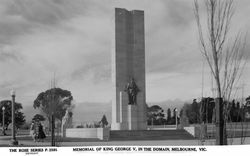 The general committee of the memorial fund today approved of the design by Mr. W. L. Bowles, the Melbourne sculptor, for the memorial to King George the Fifth, which is to be erected in The King's Domain at a cost of about £14,000. The memorial will take the form of a tall shaft of sandstone about 36 feet high, and the figure of the King, nine feet high, dressed in his robes of the Order of the Garter, will be placed on the western facade and on the shaft, and on the eastern facade will appear a figure of Britannia holding in her arms two children, representing the Dominions and the Colonies. Daily Advertiser (Wagga Wagga, NSW), 4 August 1937. Melbourne, July 20. Victoria's £17,000 memorial to the late King George V was unveiled today. 15 years after it was begun and 16 years since the death of King George V. The Governor (Sir Dallas Brooks) with Lady Brooks, unveiled tne memorial at a short military ceremony in the King's Domain attended by about 2,500. 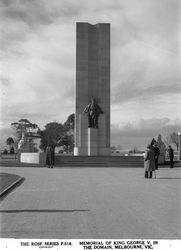 The memorial is a 55 ft. granite and sandstone column, mounted in the centre of a 30ft. square concrete base. It holds a 12ft. 2½ ton bronze statue of King George V dressed in full Garter robes and wearing the Imperial crown. Advertiser (Adelaide), 21 July 1952.